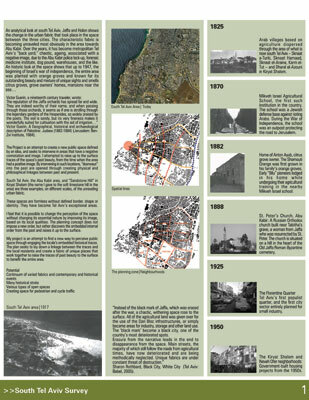 South Tel Aviv Survey | Short review of the history of south Tel Aviv - the planning region. Project's goals and objectives and primary analysis of the space. Strategy | The location components: physical, social and cognitive. New pathways to spatial perception: Lawrence Weill's theory of re-imaging the city. Mapping | Region analysis by historic maps research, contemporary maps and information gathered from local resident. Three maps of the basic components of a location. The Planning Unit | Identifying intervention locations by indicating the "traces" - the planning unit. Historic description of the area in the time it has positive image. 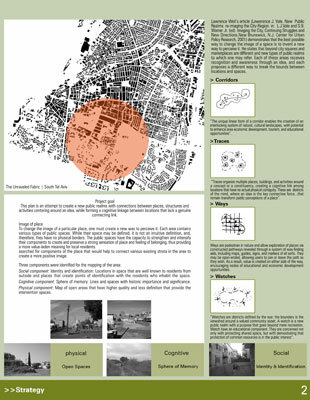 Alternative Perceptions of Space | presentation of three alternatives for the perception of space, using the traces that were indicated before, and the compilation of the analysis maps. Master Plan | Assimilation of the traces that have been identified through the mapping process to create linkage among them into a regional master plan. "A timeless effort that spans stylistic trends. Strong role for plants as spatial structuring elements and memory prompts. Very serious document with a long shelf life. Model to help students understand regionalism to its fullest extent." 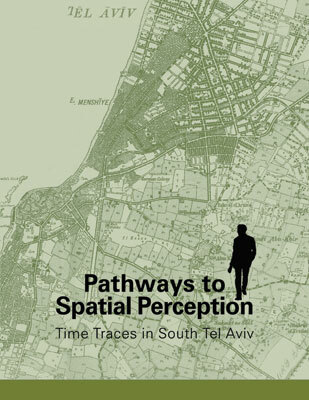 An analytical look at south Tel Aviv, Jaffa and Holon shows the change in the urban fabric that took place in the space between the three cities. The characteristic fabric is becoming unraveled most obviously in the area towards Abu Kabir. Over the years, it has become metropolitan Tel Aviv's "back yard," chaotic, ageing, associated with a negative image, due to the Abu Kabir police lock-up, forensic medicine institute, dog pound, warehouses, and the like. An historic look at the space shows that up to 1947, the beginning of Israel's war of independence, the entire area was planted with orange groves and known for its outstanding beauty and mixture of unique sights and smells - citrus groves, grove owners' homes, mansions near the sea. The Project creates a new public space, intervening in areas which have a negative image. By bringing up to the surface some of the beauty from traces of the past embedded in the area and locating doorways into the past, philosophical and physical linkage is created between the traces and the local residents. The traces are also linked to each other. The planning method is not specific to this area only, but may be modeled for other areas known for their former glory. 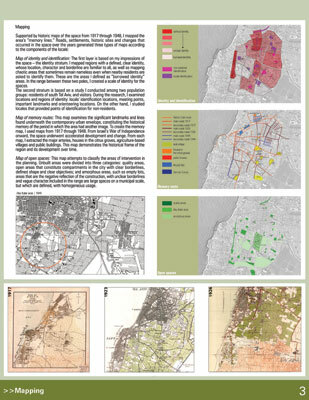 Various material was gathered: physical data on south Tel Aviv; social statistics on local population; study of community needs according to interviews with residents; and a great deal of historic material. Contemporary maps and aerial photographs aided the analysis by providing an overall view of the urban fabric of today, and enabled identification of historic points of interest and lines embedded in the space. Important historical data included old aerial photographs, old photographs of villages, groves, early housing construction; paintings; journals by scholars, travelers and explorers, each with an individual viewpoint; maps of the area from 1917 onward played a significant role in the analysis and planning, while descriptive articles on municipal planning were helpful in illuminating the planning concept. 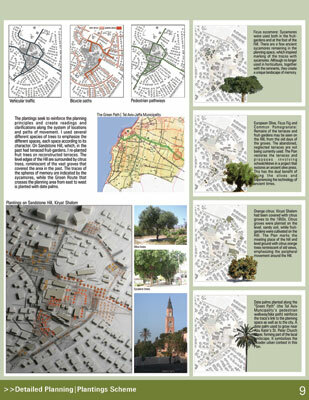 The historic material provided comparison with current maps of Tel Aviv's strategic planning with zoning designations for construction, industry and open spaces; the "Green Path" planned for pedestrians and cyclists, traversing the planning space. Local planning boards provided data on population: number of residents, socioeconomic data; physical data on residential apartment buildings, yards, open spaces and other data. Information gathered from local residents examined spatial identification, i.e., what are their landmarks, meeting points and orientation points. Educators and administrators in the educational system and the community added information on local needs for open spaces. After collecting the data, I formulated an analytical method to provide me with basic principles for regional as well as local planning. Mapping | After determining the three dimensions that are the components of the location - physical, social and historical-cognitive - a map was prepared for each dimension. The identity and identification map was based on information gathered from the public, noting points in space that are meaningful to residents and visitors. The open space map classifies the areas according to present quality, from well-kept municipal areas to the formless empty lots. The memory map is based on historical material (old villages, important buildings, roads, wells, citrus groves), raising the historic sites and routes up to the surface from their hidden layer, revealing various strata of the spatial development. Identifying intervention locations: Indicating the traces | The compilation of three maps - physical, cognitive and social - showed various places that may function as "traces," i.e., locations bearing historic memories within a defined public space that is in proximity to, or identical with identity and identification locations. The traces have been indicated as an additional layer on the map of the area. Defining users and uses | Meetings with Municipal officials and locals resulted in programming use of the open spaces for local residents needs: community assemblies and meeting places; playgrounds; picnic grounds; recreational facilities; various athletics; bike paths; youth activities; outdoor performances; parking space; and more. 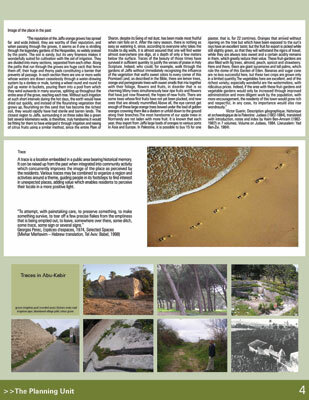 Connections and linkages | After identifying historic traces in the open spaces, I sought to respond to needs of local residents' activities in the area of the traces, to connect the uses to the location and essence of the trace. For example, remnants of the fruit-gardens of the agriculture-based village on Sandstone Hill in Kiryat Shalom are to be restored and renewed with the help of the local residents' community gardening project. The plan is an attempt to link points of interest in the space and connect them to the neighborhoods within which or around which they are located. These connections created the movement of pedestrians and cyclists that is needed in these flat open spaces. Three alternative plans are presented for the perception of the space through the traces that were located under its surface, each plan proposing different modes of connecting the traces based on different ideas. The proposed alternatives are differentiated by their spatial deployment, degree of urbanization/community formation, type of experience they facilitate, target audience, and type of activity proposed. The connecting alternative | This plan connects the city of Holon with south Tel Aviv and the center of Tel Aviv, linking the traces into one axis which becomes a route allowing "sampling." The possibility of peering through various "time tunnels" along the route creates an urban, museum-like option of passing through various memory traces and learning a bit about each phase. People's movement through time, as it were, by moving through space connects the two regions to create a hands-on learning route for locals as well as visitors. The centralizing alternative | This alternative centralizes the traces inwards into one area - Abu Kabir. It links the south Tel Aviv neighborhoods, with Abu Kabir as the vital core activating the entire area. This option recreates the old Abu Kabir to provide "doorways to memory," leading to unique experiences arising from activities conducted within the public space for area residents. The particularizing alternative | The third alternative distinguishes each trace as a unique element which functions as part of the special fabric. First and foremost, each trace is considered the focal location for the community that lives the memory embedded in the particular trace, thus each trace is designed to be integrated with community social activities. Following the development of these focal locations, I expect that in a natural manner, the community will create pathways that connect the trace locations. 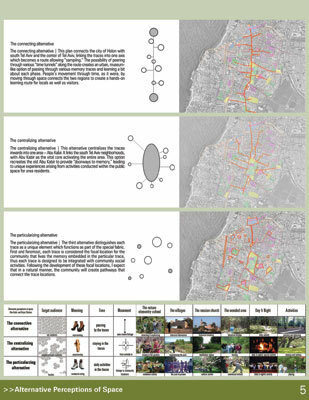 The final plan integrated the three alternatives, mainly reflecting the concentrating option that conceives of Abu Kabir as a major municipal park blended with the particularizing approach that treats each trace as a separate case, considering the development of the connections as the important factor. This linkage creates the pedestrian and cyclists pathway. 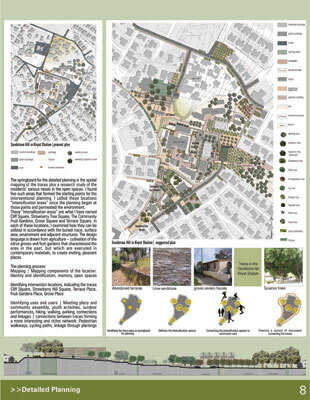 The detailed plan focuses on a single trace - Sandstone Hill in Kiryat Shalom with full implementation of the principles of analysis and of the objectives of the alternatives in their regional context as well. 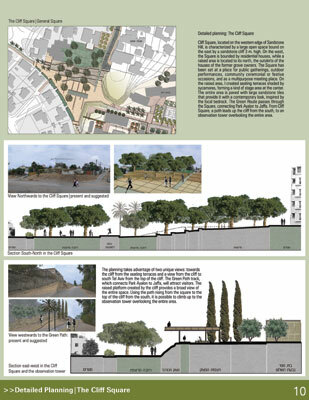 The detailed planning focuses on one of the traces: "Sandstone Hill" in Kiryat Shalom, east of Abu Kabir. This hill lies at the heart of the 1950s-built projects, with public buildings, site of a former agriculture-based Arab village, which made its living from the extensive orange groves in the area. There are remnants of the houses and fruit-gardens around them. The regional analysis generated five defined areas of intervention on Sandstone Hill and its periphery. The design language was inspired by the local sandstone ridge and the orange groves and fruit-gardens of the past. The design guidelines feature contemporary style and materials to create pleasant, attractive spaces. 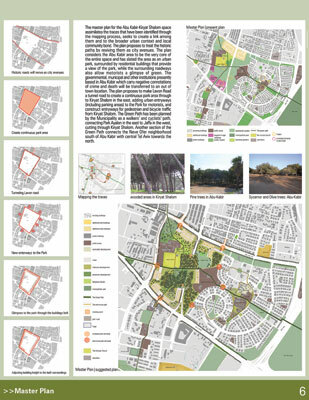 The uses of each point were integrated in the planning while responding to local needs through providing a stage for the emergence of the site's trace. The planting design reinforces the planning principles to create a layer of clarity and readability along the sites system. Several species of trees were used to emphasize the different spaces, i.e., fruit trees, citrus trees and sycamores and palms. 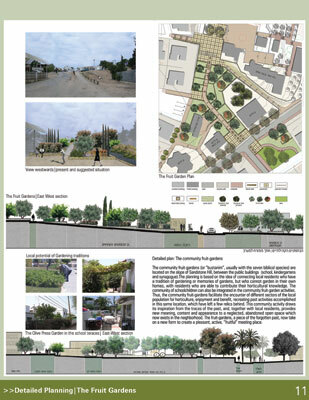 The Tel Aviv-Jaffa Municipality is the most likely to be interested on three levels: analysis method for the entire area; specific planning; and the Project's contribution to the Green Path for pedestrians and cyclists. The analysis method can serve planning agencies for other regional planning authorities, especially the Plan for south Tel Aviv. The specific plan for Kiryat Shalom is likely to be of interest to the Southern Quarter Community Administration, the local branch of the Municipality dealing with the development of Kiryat Shalom (among other duties) as well as the Green Path planners, linking Ayalon Park with Jaffa, cutting across the Project area. The Green Path itself was initiated by the Municipality. In addition, the Kiryat Shalom Community Center, which assisted in examining local needs, may also be one of the agencies promoting the Project. The Project must be implemented on two levels: broad-based municipal planning level to identify focal points for spatial intervention; and on the detailed planning level, to deal with each point. Only the Municipality can handle the implementation, with other social-planning agencies contributing to advancing the requisite research and analysis processes. The Project can go ahead even if the Municipality approves development of the traces alone, and deals on a specific level with each trace. The Kiryat Shalom component is only one example of the working method on a single trace. Regional planning will create a fabric of unique locations that will work together to beautify the space through its embedded traces. 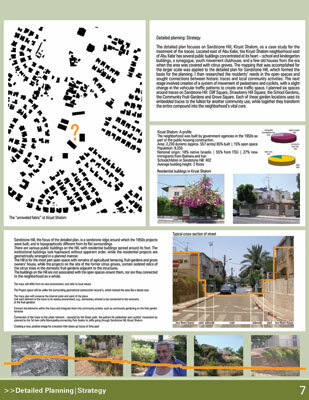 Detailed Planning: Strategy | The Sandstone Hill in Kiryat Shalom as a case study for planning a trace unit. Detailed planning's goals. Detailed Planning | Trace planning process and principles. The suggested plan for the Sandstone Hill. Detailed Planning: Planting Scheme | presentation of the movement scheme in the project and the way the planting layer reinforce the planning principles. Detailed Planning: The Cliff Square | Focus on one trace spot detailed planning: a large open space bound by a sandstone cliff. Creation of a multipurpose place for residents and a broad view platform, also for visitors. Detailed Planning: The Fruit Gardens | Focus on one trace spot detailed planning: communal gardens inspired by traces of the past to create a pleasant and fruitful meeting place.